A modified Russian ballistic missile orbited a menagerie of scientific and technology demonstration satellites Monday for a wide array of international organizations. Liftoff of the Rockot launch vehicle from Russia's Plesetsk Cosmodrome was at 1415 GMT (10:15 a.m. EDT). The mission was carried out by the joint German-Russian Eurockot Launch Services. The Rockot booster initially injected the Breeze upper stage and the payloads into an elliptical orbit with an apogee, or high point, of about 820 kilometers, a perigee, or low point, of around 320 kilometers, and an inclination of 96.8 degrees. At this point the 145-pound Czech MIMOSA spacecraft was released from the upper stage. The versatile Breeze stage then fired again to enter a near-circular 820-kilometer Sun-synchronous orbit where it left the Canadian MOST science satellite along with six tiny nanosatellites. Through the entire flight a mock-up of a Russian Monitor Earth observation satellite stayed attached to the Breeze upper stage to gather mission profile simulation data. It is to remain with the Breeze until they de-orbit together. The Czech Republic's Micromeasurements of Satellite Acceleration satellite, or MIMOSA, will probe the densities of Earth's upper atmosphere using a sensitive accelerometer specifically designed to detect slight drag forces as the craft dips into more dense portions of the atmosphere during each perigee. MIMOSA's shape is nearly spherical and carries no other instruments other than the microaccelerometer, which is an improved version over earlier similar experiments that flew over a decade ago on a Russian satellite and most recently aboard space shuttle Atlantis during the STS-79 mission in 1996. Unlike the instrument that flew aboard Atlantis 7 years ago, the MIMOSA accelerometer features two measurement ranges instead of one. Scientists hope a number of other improvements such as better temperature stability will increase the data yield over that of previous missions. Formally approved in 1996, the craft has exactly 28 sides, creating an almost perfect sphere. MIMOSA will remain unoriented during most of its mission to keep from disturbing the sensitive accelerometer. Canada's Microvariability and Oscillations of Stars spacecraft will seek answers to a number of fundamental questions about our Universe. In addition to attempting to set a limit on age on the Universe, MOST will also look at planets orbiting other stars and will study how stars eject gas into the interstellar medium. The suitcase-sized satellite features Canada's first space telescope developed by the University of British Columbia. With an aperture of just 15 centimeters, the telescope is roughly the size of Galileo's famous instrument used centuries ago. To make the ambitious science goals possible, the 119-pound craft also uses an ultra-high precision attitude control system that is able to very finely point the telescope toward targets throughout the cosmos. "Canadians can be proud that we have built the world's smallest space telescope, an instrument that helps us better understand our Universe by looking at neighboring stars. Canada is yet again at the cutting edge of space technology," said Canadian Space Agency president Marc Garneau. Because of the small physical dimensions of the telescope, the cutoff for stars to study is at about a visual magnitude of six. That still leaves hundreds of stars that will keep the spacecraft and ground team busy throughout its mission -- expected to last at least one year with a target of three to five years. "In first planning MOST, we had the same size bias that afflicts most astronomers, and really underestimated what was possible," said Jaymie Matthews, MOST mission scientist. "As a result, even after the design was locked in, we were adding new science applications, like the exoplanet studies, which weren't part of the original proposal." The Canadian Space Agency touts the capabilities of MOST by saying it will be able to make more specialized observations than any other instrument, including the famed Hubble Space Telescope. Scientists say MOST will be able to detect brightness changes as small as one-ten-thousandth of a percent in stars. This is on the same order of magnitude as the change registered when standing one kilometer from a street lamp and moving toward or away from the light just one-half of a millimeter. "This precision will allow us to detect vibrations in other stars similar to those seen in the Sun, but too subtle to be detected through the turbulence of the Earth's atmosphere," Matthews said. "It also makes it possible to measure the reflected light from giant planets orbiting nearby Sun-like stars, probing their atmospheric properties for the first time." No ground-based telescope can make such observations because the atmosphere distorts the light emitted by stars, which makes them appear to twinkle. Space-based instruments currently in orbit do not have the sensitivity and large viewing zone required, Matthews told Spaceflight Now. A groundbreaking objective of the $7 million mission is to detect light reflected from planets orbiting stars outside of our solar system. If achieved, it would be a first in the history of astronomy. Six tiny palm-sized craft also rode the Rockot launch vehicle to orbit. These relatively inexpensive satellites have missions mostly focused on science, technology, and education. The first CubeSat is for the University of Tokyo Intelligent Space Systems Laboratory, where students working on the project will test commercially available parts in space and will also conduct Earth imaging. CUTE-1 will operate for the Tokyo Institute of Technology and will test various space technologies in flight. Three nanosatellites were then to have deployed via a launch tube. Owned by the University of Toronto, Aalborg University of Denmark, and the Danish Technical University, each of these three minuscule spacecraft will image stars. The U.S. QuakeSat satellite was also delivered into orbit. It will set out on a mission with an earthquake detection experiment. The CubeSat program allows organizations to build and operate a low-budget spacecraft for a variety of applications. They are especially attractive to universities because they give students an opportunity to have hands-on experience on a real spacecraft -- a chance many students did not have in the past. "Cost is highly dependent on the mission and complexity of the CubeSat so each developer will give you a different price, but you can probably put a CubeSat together with a few thousand dollars in parts," CubeSat project co-director Jordi Puig-Suari told Spaceflight Now. "As far as personal cost it varies, but university students are cheap." Officials say launch costs for a CubeSat run about $40,000 per spacecraft. Future plans for the CubeSat project include a potential launch of up to 15 of the tiny satellites next year aboard a Russian Dnepr rocket. Managers are also working with a number of other launch providers such as the Shuttle, the Pegasus, as well as SpaceX's planned Falcon launch vehicle that could debut as early as the end of this year. Puig-Suari also said there are no real restrictions on who can build a CubeSat. "Anybody can build a Cubesat, the standard is open and easy to follow." 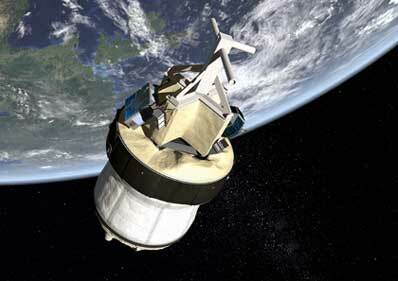 Eurockot's next launch is expected in October when it will deploy the Japanese SERVIS-1 spacecraft into orbit.